We have assisted hundreds of clients over the years with their real estate needs in Evanston and the surrounding areas. See what our clients are saying below. 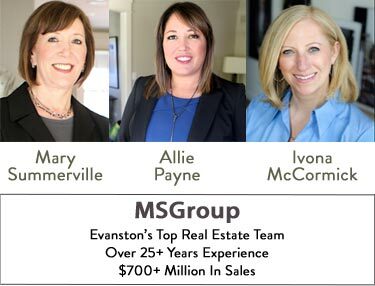 If you are thinking of buying or selling in Evanston, don't hesitate to contact us to discuss your needs. We are so appreciative of how well you handled the staging, the management company, the relocation company and the actual sale. It's been a true pleasure working with such great realtors that we could count on every step of the way. We will definitely keep you in mind and refer you to anyone we know. In addition, feel free to use us as a reference going forward. As first time buyers we could not have asked to be in more capable, patient, professional hands. They were always willing to answer our questions and address our concerns. They took our needs seriously, made time for us (when we’re sure they didn’t have any) and made us feel like we were their only clients. We found our dream home, and we’ve agreed that when we’re ready to move again there will only be one choice for us when it comes to realtors - Ivona & Suzannah. When it came time to sell our home, we chose Ivona & Suzannah as our listing agents because of their hard-working nature and good listening skills. We were impressed with their marketing plan. They got the job done! When it came time to buy our next home, they were easy to work with. In our search to purchase a home they were always receptive to our needs, and willingly showed us homes without pressure. This is the fifth transaction I've done with Ivona; two sales, two rentals, one purchase. For the sales and rentals, her knowledge of market prices appropriately set expectations, making negotiations of the deals go quickly. Her premarketing of the property resulted in early and substantial interest and immediate bids. Her management of the sales/purchase process kept everything on track with seemingly no problems (I'm sure she had to work hard to make it look simple). Ivona is first of all professional, but charming as well. I will continue to use her for all my future real estate transactions and recommend her to all. Diligent. Flexible. Intelligent. Reliable. We cannot say enough about Ivona McCormick & Suzannah Martin. They are incredibly hardworking residential sales leaders who remain committed to excellent service. They are fabulous listeners who spend time understanding their customers' needs and working diligently to exceed them. In addition to all of these wonderful attributes, they sold our condo at 900 N. Lake Shore Dr. in Chicago at the price we wanted...and set a new record for sales in our building! They worked hard to secure us a new home in Evanston. Ivona & Suzannah bring the perfect combination of talent, experience and personality to a demanding and competitive business. It is a delight to work with someone of such fine character. We were very pleased with Ivona's services as our buyer's agent. She never tried to pressure us, and in fact she would sometimes be the first one to point out the flaws of a place we just looked at. Her friendly manner and attention to our needs made us feel comfortable during the whole process of finding and purchasing a home. We would not hesitate to use her services again. Ivona McCormick listed, marketed and sold my condo located at 2951 Central St. in Evanston. I found her approach to be realistic, honest, enthusiastic and professional. She is very knowledgeable and aware of the current climate of the industry and thoroughly up-to-date with e-marketing techniques. Her skills during the negotiation process were exceptional. I am most impressed with the fact that she was able to sell my condo in the short period of three days! I certainly would highly recommend Ivona. Ivona is AMAZING! My husband and I had been looking for a home for 2 years and just couldn’t findthe right place. We knew when we met Ivona at the Open House that she would help us find the home we have been looking for. 4 months later we found the perfect house! Ivona is very passionate about wanting to find the right place for her clients. She puts a lot of heart and soul in her work. We will always appreciate how very patient she was with us as first time buyers while we were going through the motions of the purchase of our home. My husband and I had endless questions and concerns throughout the process and she always answered our questions very promptly (you won’t find a realtor that will get back to you that quickly - (I’d bet money on that!) with assurance that everything was going to be OK. She is super friendly, very knowledgeable about the housing market and doesn’t play the cheesy sales person game like other realtors seem to do. She is realistic about the market and understands what needs to be done to sealthe deal. Ivona & Suzannah were AWESOME! From the first day we spoke to each other we were at ease and knew that they would take care of everything for selling my Father's condo. But little did she know I was full of questions! They would always get back to me right away. There were there till the end with us. They always wanted to make sure we were kept up-to-date on everything! A wonderful experience for all of us.